The first line in Lieutenant Colonel John McCrae's familiar poem, In Flanders Fields speaks of the many poppies that sprang up between the graves of soldiers buried in an area of Europe near Belgium following World War I. In 1921, inspired therefore by these words, a red flower became the symbol of remembrance for fallen soldiers of World War I.
I never really understood as a child what it meant to wear a poppy. As it is with so many things when you're little, you do it because Mom and Dad said so, or the teachers tell you to. Sure the symbolism was explained, but for tots growing up in an environment of peace and innocence it's pretty difficult to wrap your head around the notion that people must fight and sometimes die to protect the life we were enjoying. With maturity, as they say, comes wisdom often sadly gained by accepting the realities of a harsh world. At my age, no one needs to tell me now why we should wear a poppy, nor of the importance of honouring our fallen men and women. 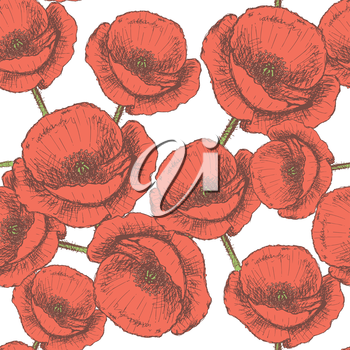 In recognition of Remembrance Day here then is a wonderful collection of poppy illustrations from iCLIPART.com.